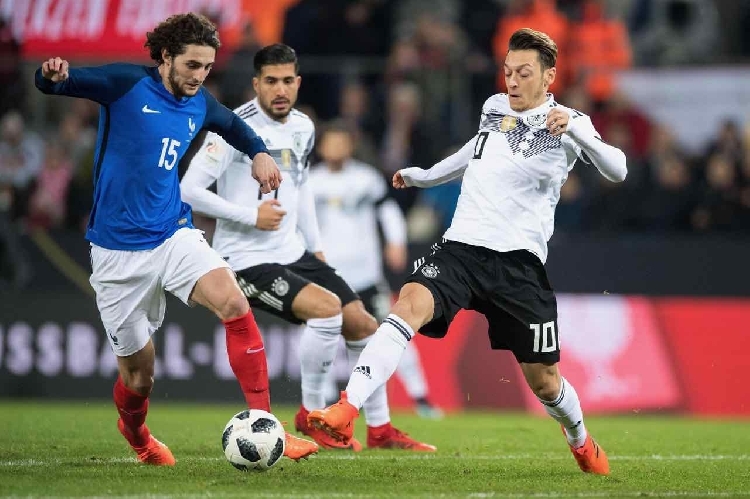 Lars Stindl scored a last-gasp equaliser as world champions Germany played out an entertaining 2-2 draw with France in Cologne on Tuesday, while Spain were held by Russia in a 3-3 friendly thriller. France and Germany are among the favourites for next year’s World Cup in Russia, and Stindl’s injury-time effort extended Joachim Loew’s side’s unbeaten run to 21 matches. “We conceded the goal from nothing to make it 2-1, but we also showed the morale to come back from behind,” said stand-in Germany captain Sami Khedira. In the two teams’ first clash since the French won 2-0 in the Euro 2016 semi-finals, Didier Deschamps’ men scored a brilliantly-worked opening goal in the 33rd minute, as Anthony Martial danced between two defenders and squared for Alexandre Lacazette to tap into an empty net. Loew’s hosts equalised before the hour mark, though, as Mesut Ozil led a rapid counter-attack and played in RB Leipzig forward Timo Werner to slide a finish through the legs of the onrushing Steve Mandanda. But the visitors still looked threatening going forward and retook the lead with 19 minutes to play. This time it was teenage sensation Kylian Mbappe who was the creator, playing a pin-point through ball that Arsenal striker Lacazette latched onto before confidently finishing past Paris Saint-Germain second-choice goalkeeper Kevin Trapp for his first international brace. The 26-year-old had only scored once in his previous 15 France appearances, but sent out a message that he could take Olivier Giroud’s place up front at international level, as he already has done for his club. But Germany kept probing and snatched a draw as substitutes Stindl and Mario Goetze combined for the former’s fourth international goal. The game was played under tight security after a friendly between the two teams at the Stade de France was hit by the Paris terror attacks on November 13, 2015. Julen Lopetegui’s visitors took control through a Jordi Alba header and Ramos’ first spot-kick, but Smolov and Alexei Miranchuk brought Russia level with goals either side of half-time. Real Madrid centre-back Ramos completed his first double for Spain since scoring two against San Marino in 2005, but Smolov grabbed Russia a draw after an encouraging performance. It was still a satisfactory international break for 2010 World Cup winners Spain, after a 5-0 thrashing of Costa Rica in Malaga on Saturday. “Russia showed a high level of play tonight as their players all looked extremely motivated,” coach Lopetegui said. A young England team held Neymar’s Brazil to a 0-0 draw at Wembley Stadium, having also played out a stalemate with Germany on Saturday. Tite’s men produced a tame performance in a game of few clear opportunities, as home goalkeeper Joe Hart only had to make three saves. Romelu Lukaku became Belgium’s all-time record goalscorer by netting the winner in a 1-0 victory over fellow World Cup qualifiers Japan in Bruges. The Manchester United striker headed in his 31st international goal from barely a yard out after some good play from Nacer Chadli, to take him clear of Paul Van Himst and Bernard Voorhoof. Portugal struggled to a 1-1 draw against the United States in the absence of Cristiano Ronaldo as Vitorino Antunes cancelled out Weston McKennie’s early opener in Leiria. Uruguay fell to a 2-1 defeat by Austria, who failed to qualify for Russia, in Vienna despite a goal for Edinson Cavani, while World Cup debutants Iceland were held 1-1 by 2022 hosts Qatar in Doha. The Netherlands made it two wins from two since their qualifying catastrophe by brushing aside Romania 3-0 in Bucharest as Ryan Babel scored his first international goal since May 2008.